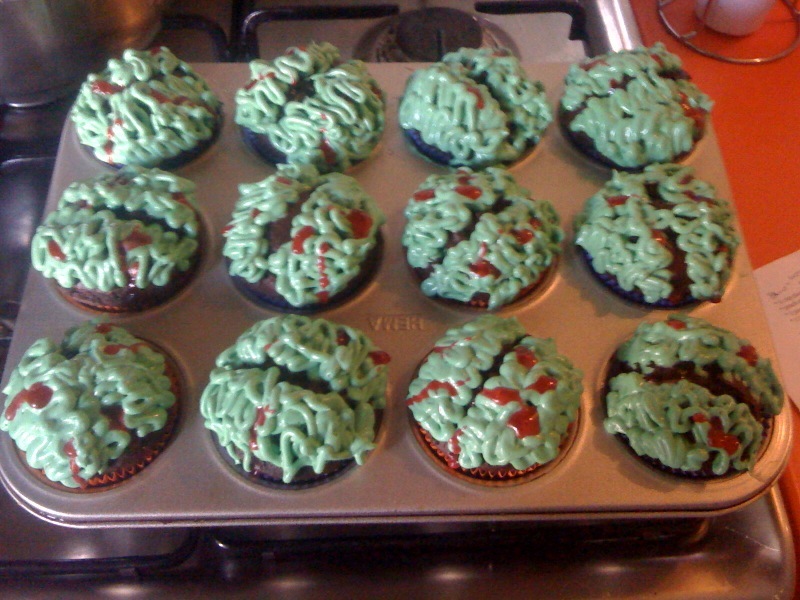 After work on Friday, I rushed home to bake zombie cupcakes for the outdoor screening of Night of the Living Dead next to a graveyard in someone’s backyard. I wanted to try a new chocolate recipe, so I went for Dark Chocolate Cupcakes from Cooks Illustrated American Classics 2009 after a very good review from the blog CAKE ON THE BRAIN. I picked up some Valhrona 70% dark chocolate on the way home, which, in my opinion, is the ONLY chocolate you should use for quality chocolate baking. The recipe yielded 12 cupcakes, and I measured everything meticulously. 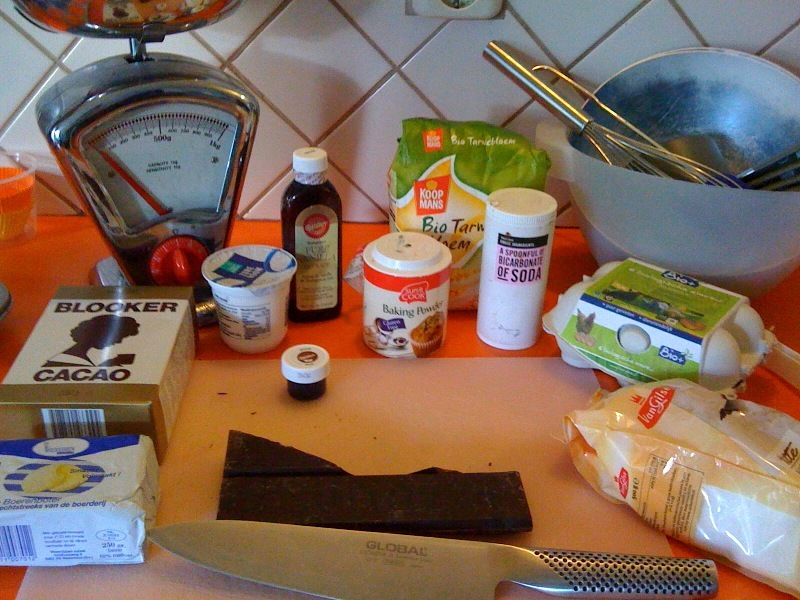 To my surprise, however, there was actually enough batter to do probably 14 0r 15…either that, or cupcake/muffin tins have grown in size in America, and my Dutch one is too small. Either way, the cupcakes domed, which is FINE in this case, but would have been annoying if I was doing any sort of fancy decorating. Unfortunately, the ‘brain’ didn’t hold up too well after a 10-minute ride jiggling around in my bike crate, so I’m glad I got photos before the transport. All in all, the cupcakes were tasty…super, super rich and chocolately. 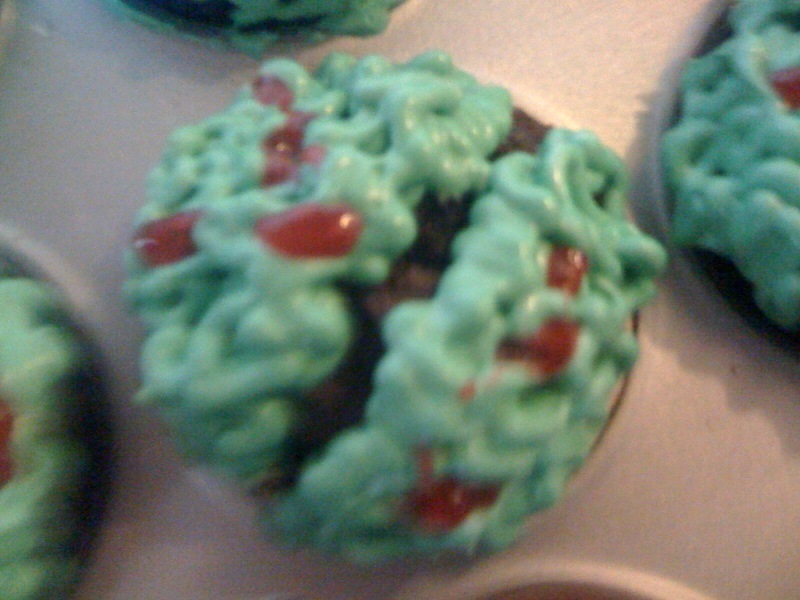 HOWEVER, it’s not my kinda cupcake. I much prefer the softer, airy texture than a dense cake-y one. My go-to chocolate cupcake is usually from Chockylit’s CupcakeBlog, but I’m always on the hunt for the recipe that I’ll vow to stick to for life. If you have something you’ve tried and loved, let me know! In the end, the screening was a bit disappointing. They played 4 ‘trailers’ before the main attracting…each ‘trailer’ lasting 20 minutes. And, by ‘trailers’, I mean…a roughly-edited selection of the best scenes from start to finish. It was past eleven by the time Night of the Living Dead started, and Liz and Colin were already head-to-chest by that time. And by head-t0-chest, I mean they were sleeping sitting up. The setting was extremely cool, with the moon rising behind the screen. 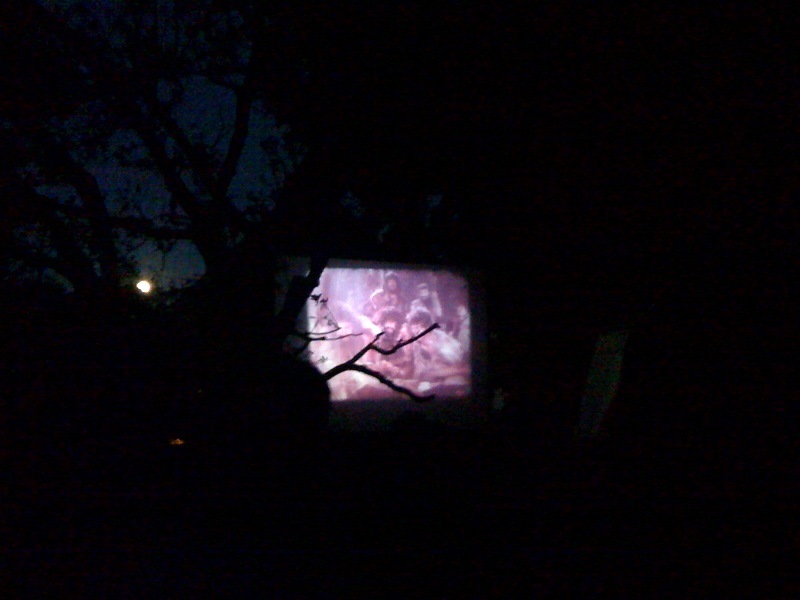 We were surrounded by woods…a great way to watch such a classic zombie flick. You can imagine our disappointment when they didn’t actually screen the entire film…only a ‘selection’ of 40 minutes worth of footage…with basically the entire ‘zombie’ part of the plot taken out. BOO EFFIN URNS #ZOMBIEFAIL.